There would be no Christianity without the Cross. The central theme of Christianity is that God redeemed sinful man. God accomplished this by taking on the nature of a servant (the incarnation), living a sinless life, and then dying on the cross to pay the penalty for our sins. Paul affirmed this ultimate display of God's love when he wrote, "I resolved to know nothing while I was with you except Jesus Christ and Him crucified" (1 Corinthians 2:2). The atonement is prophesied in the Old Testament: "But He was pierced for our transgressions, He was crushed for our iniquities; the punishment that brought us peace was upon Him, and by His wounds we are healed" (Isaiah 53:5). Not only was the atonement prophesied, but so also was the method of execution. Psalm 22 is a graphic prophecy of Christ's crucifixion. God instituted Israel's sacrificial system to prepare the people for Christ's atonement. The animal sacrifices had to be repeated on an ongoing basis -- they pointed ahead to the perfect and final sacrifice that would come: "The law is only a shadow of the good things that are coming -- not the realities themselves. For this reason it can never, by the same sacrifices repeated endlessly year after year, make perfect those who draw near to worship. If it could, would they not have stopped being offered?" (Hebrews 10:1-2). 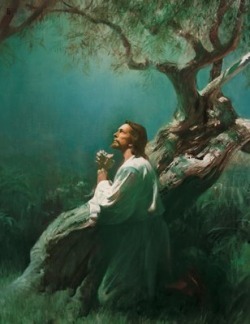 Christ's atonement was final and complete: "When He had received the drink, Jesus said, 'It is finished.' With that, He bowed His head and gave up His spirit" (John 19:30). The word translated "finished" is the Greek word tetelestai -- a word that means paid in full. On the cross Christ paid the full penalty for our sins. Every cult denies salvation through the blood of Christ alone. All add works as a necessary requirement, thus making salvation a product of man's efforts, and not of God's grace. Salvation by grace alone, through faith in the finished work of Jesus Christ on the cross, is an essential of the Christian faith. It cannot be compromised. Then He said, "Here I am, I have come to do your will." He sets aside the first to establish the second. And by that will, we have been made holy through the sacrifice of the body of Jesus Christ once for all (Hebrews 10:9-10).